Hanley - Ivy House Area - going towards Ash Bank, Bucknall and Bentillee estates. Established 1883 on the side of the Caldon canal. Diagonally opposite the Meakin factory. Taken from the drawbridge on Ivy-House Road. Incorporated as R. Goodwin & Sons (Engineers) Ltd.
.. reference to wealth generated by industry. The Millrind for the engineering connection. The wings to symbolise the overseas interests of the company. The Staffordshire Knot as the family and company were established in the county of Staffordshire. 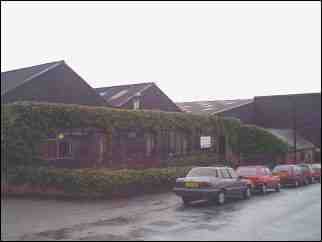 The oak leaves indicate the English roots, the ivy leaf because the foundry is located in Ivy House Road. The sculpture on top of the crest is of a steel melter. In his hand the furnace man holds a millrind to show the original engineering and iron foundry roots. The Mote (motto) 'On fonde pour le monde' - One founds for the world.